Happy Monday Beautiful People....I hope you guys had an awesome weekend! 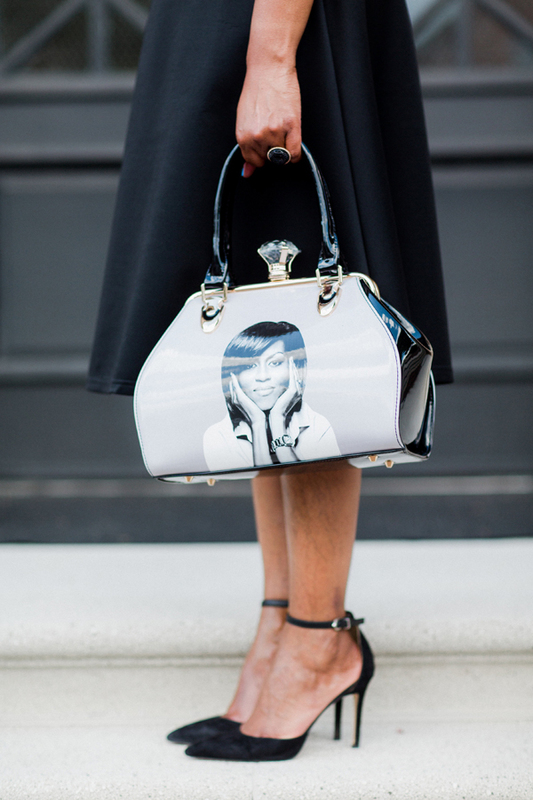 Now before you guys get too excited from the title of the blog post....no, Mrs. O isn't really with me at Medley Style...of course she's here in spirit, but today I'm giving her a major shout out for her style and I'm loving this handbag with her beautiful face gracing the cover....alright First Lady...we see ya! This image of Mrs. Obama is one of my favorites...I remember when I first saw this...I totally said to myself, I'm so going to copy her pose on this one....I think she'll be proud....what you think! Mrs. O will always be my favorite First Lady. Her grace and elegance.....her style and class...her intellect and sincerity all come shinning through...I excited for her new book to launch in November. Some of my favorite looks from Mrs. Obama are found here, here and here. Now let's talk about the handbag and the vintage dress..well, they both are from my sister-in-law's closet....when I was home a few weeks ago, she came downstairs with the handbag to show me and my response was..."Oh, you didn't get one...I can't believe you didn't get me one". She told me that she and my brother were out of town and she visited the hotel gift shop and there it was...she said there was a lady there from NY and she was selling them within the gift shop. She said there were only two left and her and another lady got the last two....sorry guys...she didn't have any information on the lady selling them and there was no information on the tag...I did a google search and came up with these sites....here and here! Now the deets on the dress....she got the dress here.....and the shoes are mine....they are from Sam Edelman that I purchased over a year ago.